Okay, okay, okay. Stonehenge is a group of rocks standing in a lonely field. There’s no getting away from that. But by the same logic, the Sistine Chapel is a load of stones with some fancy colors daubed all over its insides. Yet like the Sistine Chapel, the group of standing stones in Wiltshire, UK, known as Stonehenge are not there by accident, and there’s much more to them than just their physical appearance. Behind Stonehenge lie thousands of years of religion and culture, tonnes of planning, and inevitably death. And best of all, they’re still something of a mystery. And therein lies the continuing appeal of Stonehenge: it’s inconceivably old, and we really have no definite idea of what it’s for. These silent monoliths have witnessed the great events of English history, and people have spent their lives trying to untangle their web of mystery. Over a million people visit every year. Still not convinced that Stonehenge isn’t boring? Well, it’s time to put that right. This list of 20 fascinating facts will give you a new appreciation for these enigmatic stones, and by the end you’ll be booking your tickets to go and see them for yourself. 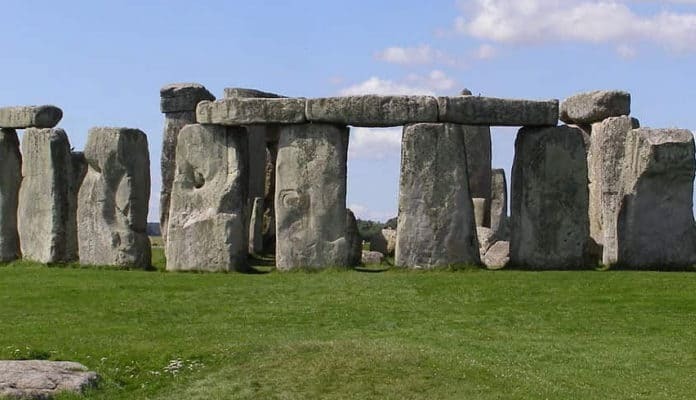 Around 3100 BC, someone looked at Salisbury Plain, and decided that it needed a bit of a lift. They ordered men to excavate a round enclosure with a bank, with an entrance at one end. For reasons lost to history, they buried the bones of oxen and deer antlers in the ditch. Even weirder, these skeletal remains were considerably older than the remains of the flint tools used to dig the enclosure. This suggests that they had been preserved for their religious or cultural significance, and were being buried there because they were important. And these builders didn’t stop there. Around the inner circumference, 56 pits around a meter in diameter were dug. It was once thought that they held wooden posts to make a wooden version of Stonehenge, but now archaeologists aren’t so sure. Additionally, the cremated remains of 64 people were stuffed in and around these holes. It’s believed that up to 150 people were originally buried there, making Stonehenge the largest Neolithic Cemetery in the British Isles. We have no idea why any of this was done, but what we do know is that Stonehenge is a cool millennium older than the pyramids.